The durable and reliable Kenworth T800 is especially popular in logging applications. It has a sloped hood for exceptional visibility, and set-back front axle for tight wheel cut and maneuverability. The T800 offers engines with a wide horsepower range, several radiator sizes up to 1780 square inches, and various rear axle ratings. Logging customers typically order the T800 as a day cab. The popular Kenworth Extended Day Cab option provides an extra six inches of length, five more inches of cab height, two additional inches behind the wheel, up to 21 degrees of recline in the driver’s seat and two extra cubic feet of storage behind the driver’s seat. The T800 can be specified fully dressed for severe service. The T800 marked its 25th anniversary in 2011. The new Cat CT660 vocational truck has passed all requirements of Caterpillar’s rigorous new product introduction process and is approved for shipment to customers. Customer deliveries of CT660 vocational trucks began in September. Under the hood, the CT660 is powered by Cat CT series vocational truck engines with ratings specific to vocational truck applications and horsepower/torque combinations to tackle the toughest jobs. Cat CT11 and CT13 engines are available now, and coming in 2012, the CT15 will offer an even bigger power boost. Used for years in vocational applications around the world, the CX31 automatic transmission has a proven track record for quality and reliability that helps maximize uptime. Caterpillar continues to ramp up CT660 production to fill customer orders, Cat dealer rental fleets, and dealer inventory. Most Cat dealers in North America have held or plan to hold open house events in order to introduce customers to the CT660 and explain how the trucks can be configured to meet their demanding vocational applications. The Titan by Mack delivers the attitude and torque required for hauling heavy loads, while incorporating advanced engineering for excellent visibility, productivity and driver comfort, says the company. This new offering extends the company’s tradition of application excellence, and follows in the heritage of other classic big-block, long-hood, and Mack conventional heavy-haul tractors. The Titan model comes with a full complement of transmissions, suspensions, axles, and the company’s Cornerstone chassis. The Volvo VNL 630 provides a spacious cab and mid-height roof, offering plenty of room for both stand-up and sit-down comfort and relaxation. The sleeper is available with two bunks and lots of storage. Handling and maneuverability make the VNL 630 a dream to drive and the ride is exceptionally smooth and quiet, says the company. In addition to the comfortable work environment, every VNL 630 is built to a demanding level of quality that ensures durability and lasting value. The 630 also comes standard with the industry’s leading collision protection technology and Volvo Enhanced Stability Technology to stop jackknives and rollovers before they happen. When it comes to power, the 630 is available with the Volvo D13 or D16 engines, allowing customers to choose up to 550 horsepower and 1850 lb-ft. of torque. Mated to a Volvo engine, the 12-speed Volvo I-Shift automated manual transmission has a 2323 lb-ft. torque rating, an array of PTOs, and delivers outstanding fuel efficiency, according to Volvo. Of all the hazards in logging, the scariest one is compromise. 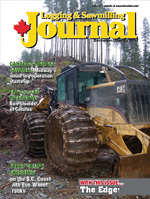 Logging operations run with demanding schedules and in even more demanding conditions. Western Star Trucks says that log haul contractors need a truck that’ll show up, ready to work, day in and day out. Hand-built, with thousands of customization options, a Western Star truck means owners get to build the truck they need for the job. Choices include a severe-duty cab and a variety of heavy-duty truck components including Allison transmissions, planetary axles and the TufTrac suspension. It takes a tough, reliable truck to safely maneuver big loads through rugged, steep—and often slippery—terrain. With suspensions and frames capable of up to 160,000 lbs GCW, the Coronado SD is designed for this extremely tough job. Packing 600 hp makes the Coronado the king of the woods, says Freightliner. With the Coronado SD, owners can choose between Detroit Diesel or Cummins engines. All three of Detroit Diesel’s flagship engines—the DD16, DD15 and DD13—are available, along with the Cummins ISX15. Powering up a logging road, International Trucks says that log haul contractors want a truck that’s ready to take on anything. The International PayStar delivers. The Paystar is purpose-built from the ground up for on/off-highway severe service applications. Features include standard 12.25” high strength single frame-rail, standard huck-bolted chassis components, high-strength, long-lasting aluminum cab, GCWRs up to 150,000 lbs, available one and two-piece windshields, and largest aluminum cab in its class equipped with a Whisper Cab sound insulation package. The Peterbilt model 389 follows in the standard-setting tradition of the company’s traditionally styled truck models. With improved aerodynamics and new technological innovations, it commands driver preference while helping reduce operating costs. Peterbilt offers a variety of front and rear suspension options including proprietary units that are lightweight for increased load capacity. A lighter weight cooling system provides increased capacity to accommodate the highest horsepower engines. Other features include a new fan shroud design and silicone hoses. The luxurious Platinum Level interior features a “soft-touch” padded dash, a GPS navigation system, LED backlit gauges, burl wood grain and a powerful HVAC system for year round comfort.